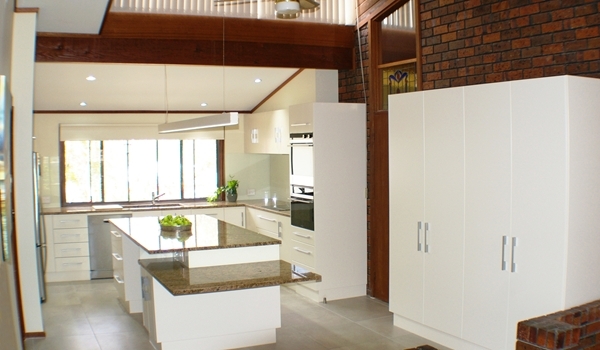 Contemporary Modernist Style Kitchen Renovation with Satin Two-Pack and Granite Benchtops. 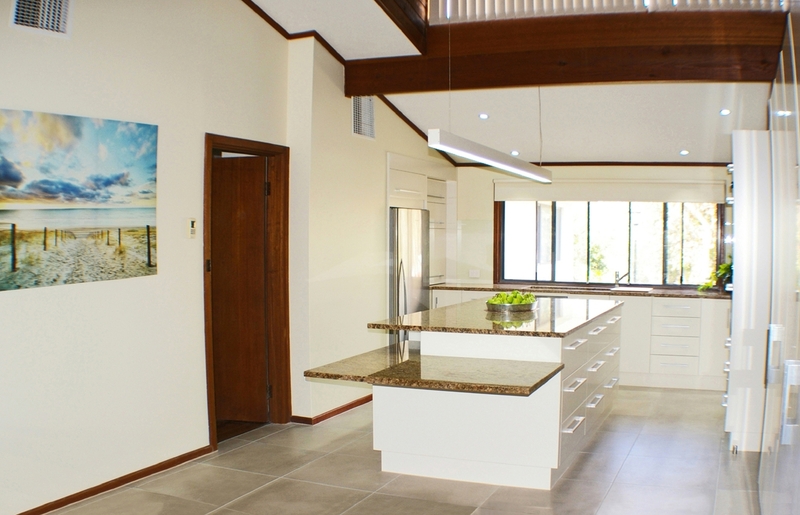 "gravity defying Cantilever Granite table top extending out from the Kitchen Island bar"
Hi and thanks for visiting our page about this Adelaide Kitchen Renovation that we have done for clients Kathy and Michael in a Modernist Style. Our clients Kathy and Michael first contacted us with the desire to bring their Architecturally designed Caj Amadio modernist style home back up-to-date and as part of this desire we suggested creating into our Design a Granite Cantilever Benchtop which not only provides unencumbered leg room underneath but it also adds a very attractive modern feature to this beautiful functional Kitchen. Their lovely 1980s split level home nestles in the beautiful Aldinga Scrub and was designed with a mix of light plaster walls juxtaposed to exposed feature brick in places. This open plan home has high raked ceilings with exposed Oregon beams and large windows, giving it a sense of airiness and space; but it still had its original dark Veneer Kitchen cabinets typical of that period and these were now well worn, damaged and needing an-upgrade. This old 80’s Kitchen also lacked the storage space Kathy needed and its original design was broken up into small disjointed work areas with poor workflow making it a chore to use and so because of all these issues, Kathy had decided that it was time they should have a full Kitchen Renovation done and knowing as a starting point that she wanted this to still be done in a modern Style. 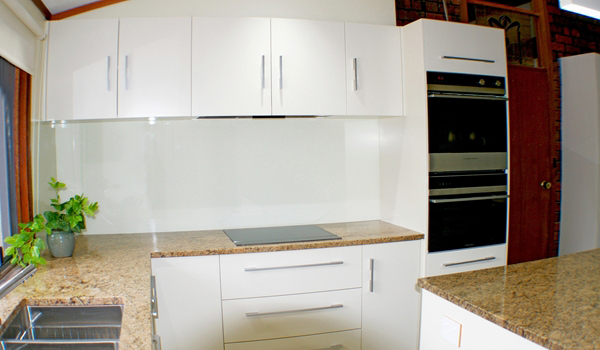 Kathy knew she wanted a new modern style kitchen; and was wanting her new cabinets to have a satin finish and needed her Kitchen to be made of easy to clean, easy to maintain and durable materials which would still look their best over the next 35 years. We were really pleased that Kathy and Michael asked us to design and make for them this new kitchen which they could spend time together in. They asked that we incorporate a generous space for Michael to spread out with his daily newspaper and that this be at table chair height; where for this we Designed a gravity defying Cantilever Granite table top that extended out from the new Kitchen Island bar. On Kathy’s wish list was that we also incorporate lots and lots of storage space as well as adding more usable work bench space, plus creating space for her family and friends when they visit, so they can perch on a stool and chat. As part of the design process we also changed their new kitchen layout so that it now has a better work flow than that of the original kitchen and this now making it a more pleasurable kitchen to use. The new Kitchen Design we produced for Kathy & Michael’s new Kitchen Renovation has made better use of this area, we have increased the overall foot print of the Cabinetry and have almost tripled the storage space of the original old kitchen. 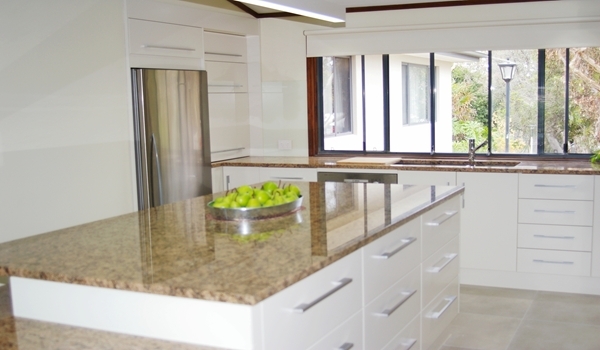 We also created much more usable benchtop space which we have also better optimized, so now includes easy access to appliances and a very large kitchen island unit acting as a central work space and place for family and friends to gather and enjoy. Once our design was settled we then custom made this Bespoke Kitchen, as well as us completing this full Kitchen Renovation for Kathy & Michael. 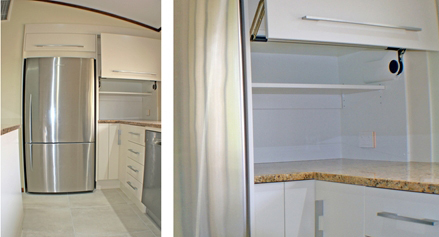 In addition to designing and making their large four door pantry, we also included an Appliance Stable with accompanying dedicated storage for all of those regularly used ingredients, close at hand and easy to access with these storage spaces all having Aventos Lift-up-Flaps and soft close functions. We also incorporated 18 large drawers for pots and crockery, plus another 8 smaller utensil drawers with dividers which we positioned close to where they are needed with all our drawers having premium Full Extension, Soft-Close, Hidden, Blum Runners for easy full Drawer access of their contents. 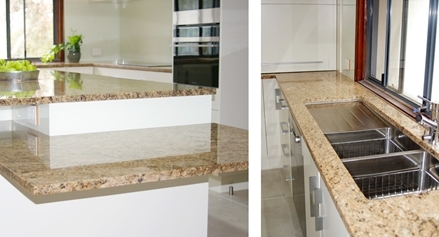 Kathy also asked that we include a Double Undermount Sink with the unusual feature of it also having a stainless undermount draining board, which we were gladly able to produce while also making this Granite top out of one single piece. Here we also used a three in one Culino Tap here with the Hot, Cold and Rain Water all in the one tap fitting, eliminating the need for a separate rainwater tap. We incorporated into their design a deep Falmec Milano Undermount Rangehood with ducting and a remote fan and motor housed outside providing super quiet operation; enabling Kathy & Michael to still hold a conversation while cooking, as well as it powerfully extracting 1140 cubic meters an hour so to help keep their new Kitchen clean and their house free of cooking fumes. 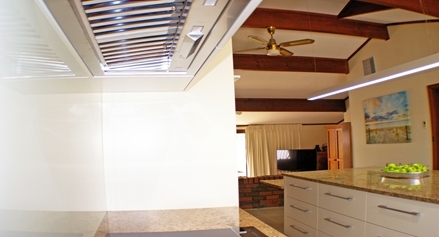 This type of Undermount Hood is not only quiet, easy to clean and very powerful, its design is also very unobtrusive and helped us maintain the clean design lines of their Kitchen without any compromise to the Hoods efficiency and function. Kathy & Michael also used a Bosch Stainless Steel Dishwasher, a Fisher Paykel Stainless Refrigerator along with a Fisher & Paykel Induction Cooktop and easy to clean Pyrolytic Wall Oven and matching Combination Microwave with Grill. The sink is an Oliveri. 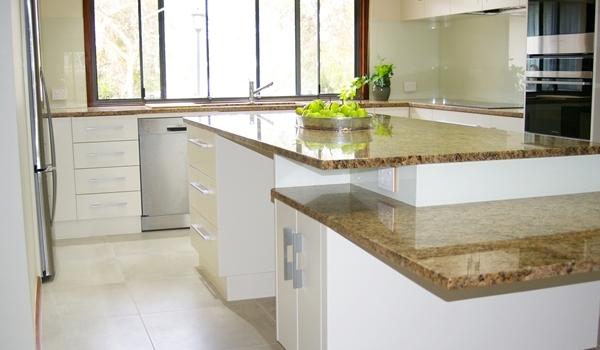 In keeping with this Modernist Style Kathy & Michael also selected 30mm solid Granite Benchtops in Yellow Venice, while including the use of this same Granite for the “L” shaped Cantilever table top. We recommended Kathy & Michael use Satin Polyurethane Two-Pack Doors to best meet their future requirements and we finished these in a Dulux off white colour called Hogs Bristle at Half strength. We also made and installed for Kathy & Michael toughened Opti-Clear Glass Splashbacks, keeping with this Modernist Style while these also being really easy to clean, hard wearing, stain proof and are easy to maintain. We finished these Glass Splashbacks in the complimentary Dulux colour called Off White with this providing a slight contrast to the Wall and cabinet colours. 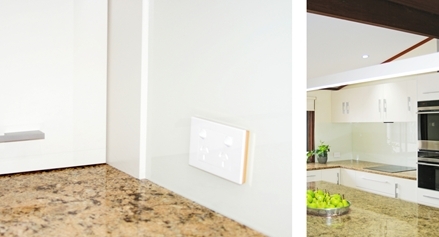 Our design took everything into consideration and included such details as new Vivo Power Points with Rose Gold shadow edge moulds which ties in with the Granite colours. We also selected and fitted new Stainless Door Stops on the floor to match the appliances. We also sourced Stainless Handles which have the exact same design as the Oven Handles. We also include lighting in our planning to ensure all spaces are well lit; so Kathy & Michael don’t have to work in their shadows. This included the placement of angled LED down-lighting but we also had a custom made linear LED Pendant made to the perfect length for the Island and then we also painted this with the same satin two-pack in the Dulux Hogs Bristle to match their cabinets. In addition to the usual requirements of electrics and plumbing for this full Kitchen Renovation we also replaced Kathy & Michael floor tiles using 600 x 600 square Australian Made Belga Ivory tiles in a matte finish, as well as repairing and re-flushed walls and ceilings and painted. 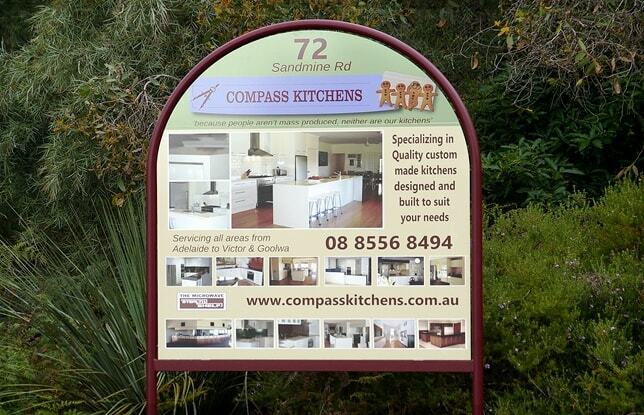 All in all it was great to be given the opportunity here to design this beautiful functional kitchen for Kathy & Michael as well as us having the pleasure to custom make this high quality Kitchen for them and then being part of their family for a short time while carrying out this full Kitchen Renovation in Adelaide at Aldinga Scrub and bringing their delightful home back up to today’s modernist style and producing for them a Kitchen which is now destined to greatly outlast that of its 1980’s “modernist original”.